Buy your wholesale visine eye drops from our personal care section. We stock the top brand of eye drops in the world from Johnson and Johnson. Visine is a top brand nationwide and nice to have around when you get something in your eye or just for when your eyes are very dry. Choose the wholesale eye drops to best suit your requirements. Whether you choose Visine red eyes or another of the various moisturizing eye drops made by Visine, you're sure to find quick relief for your eyes at a great price for your wallet! 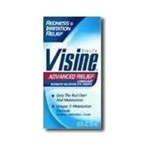 Visine Tired Eye Relief - 0.5 fl.oz. Visine Personal Care Eye Drops - 0.5 Fl. Oz. Visine Totality Multi Symptom Relief Eye Drop - 0.5 Fl. Oz. Visine Maximum Redness Relief Eye Drops - 0.5 Fl. Oz. Visine eye drops from Johnson and Johnson are the top brand of lubricating eye drops nationwide, and we've got them here in all of their different formulas and at wholesale prices. This includes Visine for Contacts, Visine AC, Visine Advanced Relief, Visine Original Formula, Visine Tired Eye Relief, Visine Personal Care, Visine Maximum Redness Relief and Visine Totality Multi-Symptom Relief. These bulk eye drops are identical to those sold in leading pharmacies but are available in cases of 36 units each for most items. The two exceptions are the Advanced Eye Drops Bottle on the Go, packed in six bottles per case, and the Original and AC double pack, which come 14 units per case.